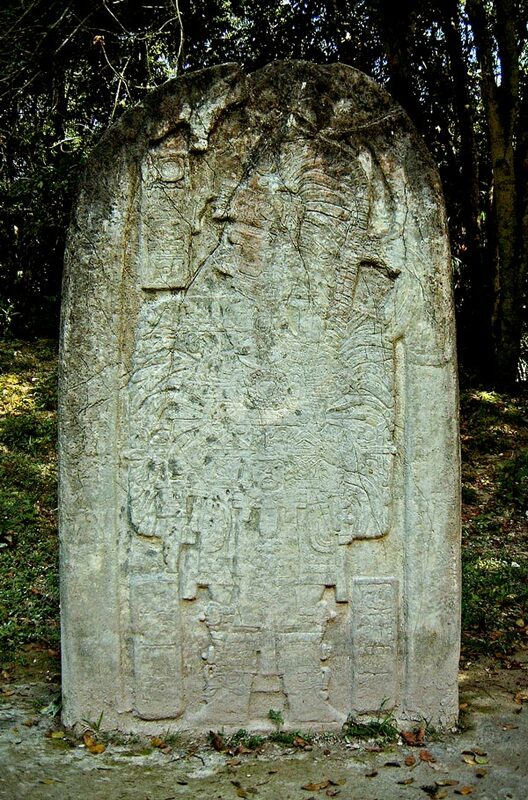 Stele 16 lies within Tikal’s Group N complex, also known as 5C-1, and has a date of 711 AD written on it. Group N is a twin pyramid enclosure, which were very common both at Tikal and across the Mayan territories and clearly were part of a ritual process. That ritual is thought to have taken place every 20 years, in keeping with the sacred calendar. Stela 16 is found next to Altar V and between them they are though to tell of a great ruler, Jasaw Chan K’awiil I, and a ceremony in which the enclosure, Group N, was erected and during which his buried wife was extracted from her grave and reburied.